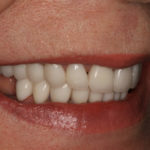 A full-mouth rehabilitation involves the entire dental team. That means coordination through a variety of different communication channels, including lab scripts, phone calls, digital scans, etc. Getting it right is all about how well you can clarify your case expectations. On the blog, we’ve talked at length about patient communication and lab communication. Both are essential in complex cases. 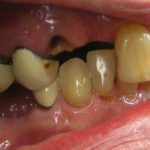 Additionally, we’ve looked at multiple cases involving in-depth restorative treatments that examine a patient’s oral health from different perspectives. These examples demonstrate why you must approach each case with an open mind and understand that you will never fully know what you’re getting into. But the results are worth it! My wonderful patient presented with a series of challenges that required multiple phases of treatment. 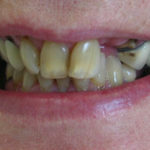 She had significant staining and missing teeth, two problems that require esthetic and functional considerations. 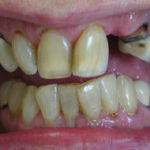 With comprehensive treatment planning, this patient was able to be restored back to function with a great result. 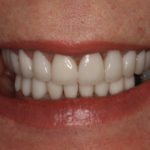 While this patient was still in the process of treatment, with posterior molars as her next phase, these photographs illustrate what a difference a confident smile can make! The restorative material chosen was IPS e.max. A facial cut back was completed by Gold Dust’s esthetic team. 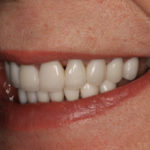 Did you miss the last case of the month on photographic case presentation for porcelain veneers? Read it here. Go back even further to read one of our favorite cases, where a clinician created the perfect wedding day smile. Catch up on that story here. What is the first step you take when handling a case that will likely be quite complex? Please let us know your thoughts in the comments!